Hi, Thank you, friends and viewers. Today I will post how to make roasted eggplant chutney recipe. 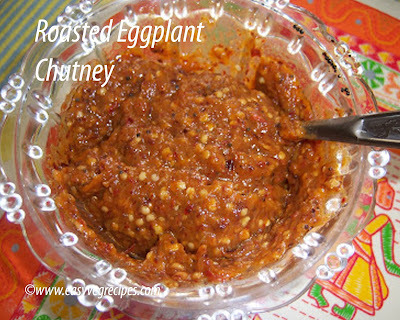 Roasted eggplant chutney is the best and one of the most favourite chutney. Roasting or grill gives a kind of smoky flavour to the vegetable. 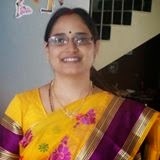 We Telugu people like chutneys very much. It is a must side dish in every meal. We get huge size eggplants in the months of November and December. After this period we get them very less and even if we get also they won't be tasty and tender. So we make roasted chutney with them in these months only. Roast them and prepare tadka. MAke chutney using mortar and pestle instead of using mixer grinder. It really tastes yummy!! Everyone likes it very much. Roasted Eggplant Chutney -- Serve it with hot piping rice and ghee. Wash the eggplant and apply oil to it. Put this on the stove top and grill for 10 minutes, while turning it occassionally grill it compeltely. Cool the grilled eggplant under tap water. Slowly remove the skin and mash it and keep it aside..
Heat oil in a kadai, add mustard seeds, black gram and fenugreek seeds. Allow them to crackle. Add asafoetida and red chillies. Switch off the flame. In a blender jar add red chillies and some portion of seeds along with salt, turmeric powder and tamarind. Grind it a coarse powder. Add the mashed brinjal and press pulse button in mixer grinder. If using mortar and pestle, do it in the same way. Serve roasted eggplant chutney with hot piping rice and ghee. Thank you visiting my blog. Hope you liked all my recipes. Feedback and suggestions are appreciated. For more chutey recipes click here.